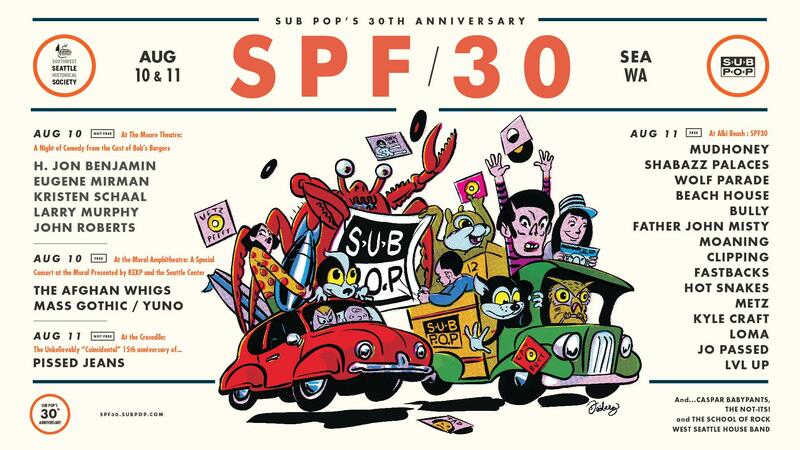 SPF30: Sub Pop’s 30th Anniversary Concert, is happening this Saturday, August 11th, 2018 from noon-10 pm. With road closures and limited access it's going to mean taking transportation alternatives to join the thousands expected on Alki Beach on Aug. 11. The lineup features Beach House, Bully, Clipping, Kyle Craft, Father John Misty, Fastbacks, Hot Snakes, Jo Passed, Loma, LVL UP, METZ, Moaning, Mudhoney, Shabazz Palaces, Wolf Parade, Caspar Babypants, The Not-Its!, and The School of Rock West Seattle House Band over four stages along incredibly scenic Alki Ave. in the Alki Beach neighborhood of West Seattle. You are urged NOT to drive anywhere in the vicinity for a variety of reasons. We strongly encourage you to purchase your Water Taxi tickets in advance or use your ORCA card. Fans also can ride transit to the beach party via Metro’s Route 50 from the Othello light rail station or from the Alaska Junction. On Saturday, Route 50 buses will operate every 15 minutes from 10 a.m. to midnight. Fans can also ride the RapidRide C Line between South Lake Union, downtown and West Seattle to connect with Route 50 or with the SPF30 private shuttle at the Alaska Junction. ...to SPF30 at Alki Beach and back. There will also be bike shares at some strategic locations as well as staged throughout West Seattle. Look for bikes at these locations. If you must drive, please carpool, designate a driver and know that we will have a parking lot. The parking fee will be $20. Credit/debit cards and cash are acceptable forms of payment. Location is the 2500 block of Harbor Ave SW across from the 7-11. The Google Maps Link is here. 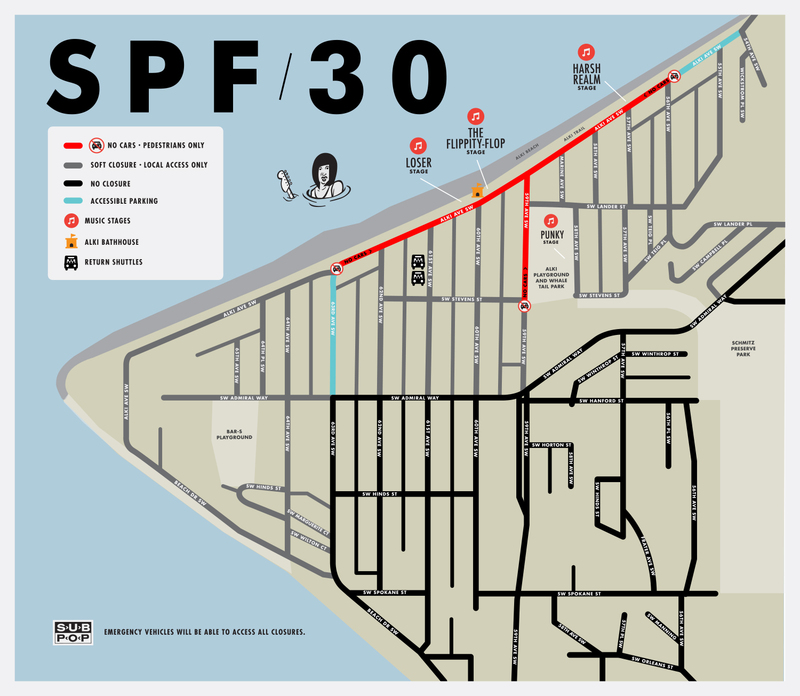 The designated parking area for SPF 30. From this lot you can either walk to Don Armeni Boat Ramp (a distance of almost a mile) to catch a free shuttle (Arriving and departing roughly every 20 minutes), or rent a bike and ride the Alki Trail to the festival. Accessible parking hang tags/placard will get you through local access street closures to these parking spots. Comfort stations at Alki Beach, as well as the comfort station at Alki Playground (home of the popular whale tale), will be closed all day on Saturday, Aug. 11. Numerous portable restrooms will be available at both locations. Additionally, all fire pits will remain locked at Alki Beach on Aug. 11 and will reopen after 4 p.m. on Aug. 12. Fires outside of these pits are prohibited. Is 63rd between Alki and Admiral disabled parking only? Can those who live on 63rd park there?